Finding some perfect DIY Headboard ideas to inspire you in making improvements in your bedroom would be a pretty challenging job. But, when it’s all about your best room in a house, you’ll do what you want whatever it takes, right? Choosing the right design of the headboard would completely transform the feel and look of the bedroom. So, you need to be careful when choosing the right design for your own style. 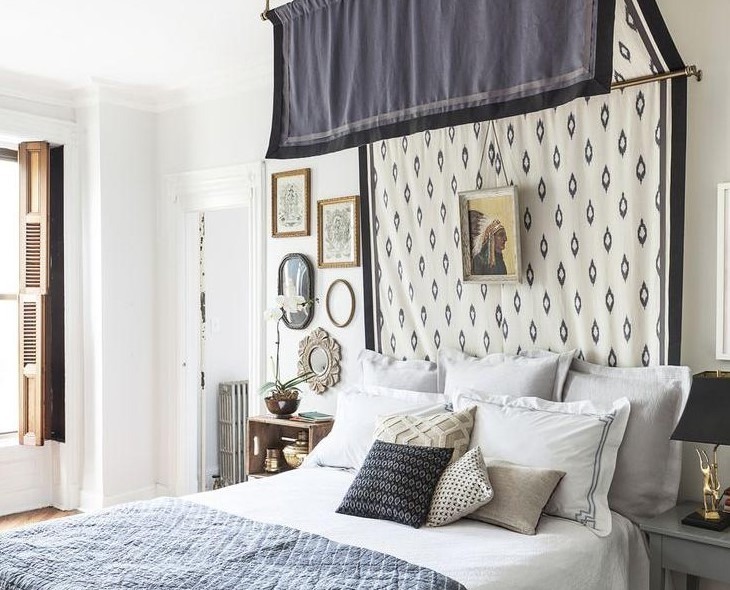 In this article gallery, we’ll provide you with 15 pictures of creative DIY headboard ideas that definitely suit your style. As you know, there are a lot of headboard designs that are also available in the variety of fabrics, and sizes you can find on the store. There are a bunch of choices you can make, whether you want to have the simple ready-made one, or you can build a headboard yourself to take your creativity and its originality into a whole new level. A DIY furniture is a solution to your budget problem. It’s even better that you can create your own design and make it as your fun weekend project to deal with. The materials could come from anything you have in your house, like stacks of books, wood planks, pillows, or cabinets. You could also be extremely creative by applying some cool stickers, or other forms of artworks. Before you start exploring the ideas, you may need to know why you should choose to have a DIY headboard or making your own headboard. It would save a lot of money, especially if your bed is a California King Sizes. Everyone can do the project. For DIY fans, they can take a single home economics class in school. You can make your headboard that fits your own original tastes. The DIY headboard will be more durable than the one you find on the store. Well, those must be pleasing you dealing with DIY headboard ideas. Let’s get down to business. This first idea is a pretty good suggestion to start with. It’s the right thing if you want to label this as one of the easy-to-make DIY headboard ideas. With that size of the bed, you will need 15 of those pillows. You could create a one-of-a-kind look with your own taste of color combination. 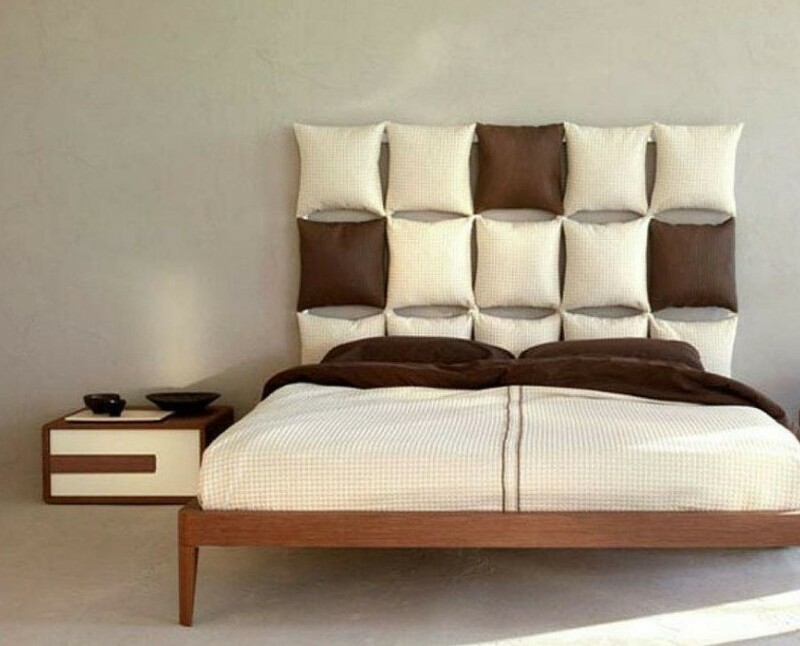 Letting you sleep tightly in style is what this cool headboard would do to you. Just hang those amount of pillows and mount them all on the wall. This minimalist bedroom looks fantastic with that unique pillow headboard. In order to manage the minimal decoration of the bedroom, the headboard color combination is enough to cover the whole atmosphere. Some unused picket fence you left in your warehouse can be a great alternative for your DIY headboard material. The old picket fence would transform into a rustic-chic headboard by a simple project. The pickets need to be cut up into small ones. After that, the small pickets need to be cleaned and refinished in various style of stains. You have to let it dry from the heat of the sun. Next, the pieces were put into a weathered lumber frame. If you are into rustic style for your bedroom, this headboard is perfect for you. Combining it with a white bed and wall would give the headboard a chance to shine brightly as the focal point of the as. The arrangement of the stained pickets is a work of art. I believe that your reaction that first time you see this is a little bit skeptical. It’s too simple and poor looking for a room that should be elegant and exclusive. Yes, it’s definitely is. But, when you look closely with the eyes of a home designer, this headboard is so unique. It’s close to the style of industrial for a furniture. The whole structure looks like metal but it’s not. It’s made of PVC pipes which are painted silver to get the metal look for the industrial style. To make it even more interesting, the designer decided to string a twine between the pipes. 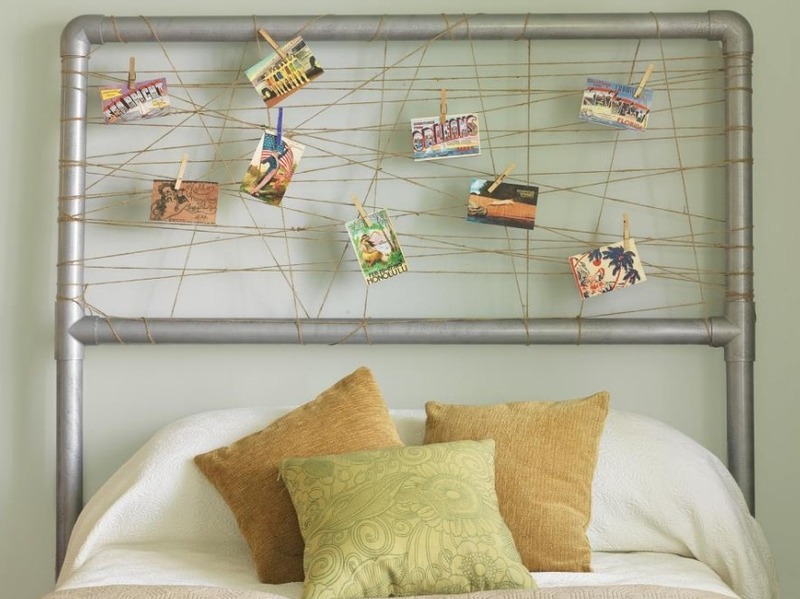 The clothespins are there too to stick the vintage postcards to increase the level of interest for this unique headboard. The first time I saw this DIY headboard, I know that this is a girl’s bedroom. The impression of the feminine is all over this bedroom’s atmosphere. The choice of colors and the choice of decor design. 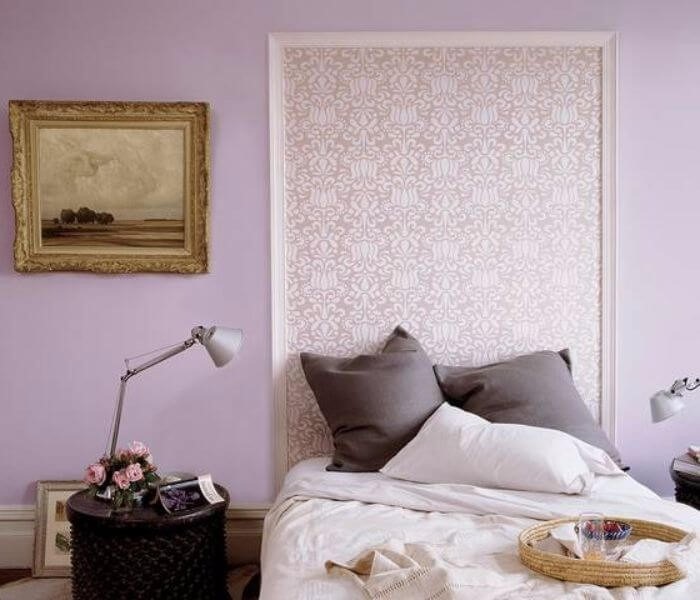 The green wall looks great with white decoration as well as the purple colors on the bed. This bedroom is perfect for your daughter. One thing that attracts my whole attention in this bedroom is apparently the branches. The designer creates such an enchanted forest as the focal point of this bedroom. The branches color are cleverly matched with the old thrift store headboard which is in white. Instead of just empty branches, the pretty birds glitters, and ribbons are added to increase festivity. 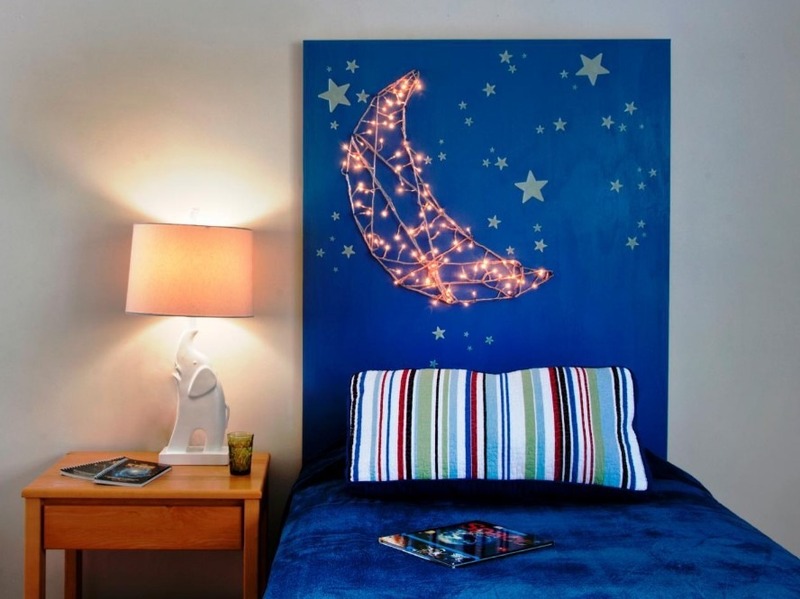 That moonlight wall decor is actually made of holiday lights. This little boy’s room looks so comfortable. The calming bold blue color that represents the night sky become the focal point of this bedroom. The headboard and bed are like one, so it can be a little bit weird if there’s no that colorful-striped pillow cover in the middle to separate them. To accompany the moon lights, the starry stickers are added. For the record, that sticker is glowing in the dark. When all the lights in the room are off except the moon lights, the star stickers are ready to impress with its amazing glows. The little boy wouldn’t be worried about the room being too dark. Do you have some T-shirt collection that ain’t fit you anymore? Or you might have some T-shirt collections that you want to get it displayed instead of wearing it. Well, one way to do that is to stick them on your headboard. Believe me, it’s not gonna look weird. You just need to know how to arrange the color. 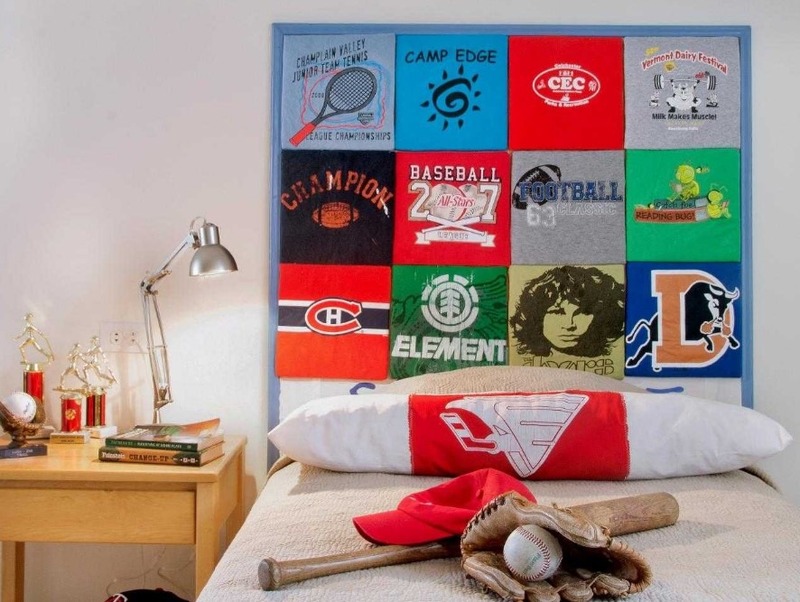 Take a look at this T-shirt headboard. This DIY Headboard idea is placed inside a kids bedroom. The graphic on the T-Shirt is what this headboard design all about. The bedroom would look fun and entertaining. You could do whatever you want to arrange the T-shirts collection. For instance, the t-shirts should be all red, or the T-shirt should be all with the same graphic but different colors. Bed canopies are a great alternative to give a variation to your headboard. This type of headboard is quite unique, you don’t see it everywhere. It looks cozy and sophisticated. This is perfect for your small-size bedroom because it can create an open atmosphere around the room. Building this headboard is easy, it can even be your weekend project. In order to start, you’ll need some supplies like curtain rods in 2 adjustable pieces, 2 pieces of ceiling curtain brackets with its wall mounting, and anchors and screws. The fabric is the main material of this project. You’ll need to prepare the fabric’s width that matches to your bed. The fabric’s length should be added with 5 feet extra. Just looking at this headboard, you’ll realize that it looks so simple. Maybe, it’s the simplest DIY headboard idea in this page. The concept is framing a wallpaper sheet. There will be so many options you can have dealing with wallpaper design pattern. You can play with the color combination, graphics, etc. Choose the wallpaper pattern you like the most, the pattern that would make your bedroom more striking. Then, you can frame it with whatever size you want. You have the opportunity to get it bigger or smaller. It is up to you to improve the beauty of the room. Besides frames and wallpaper, you’ll need saw and glue. It’s not the first time I see pallets which are transformed into something better, like this part of the furniture. 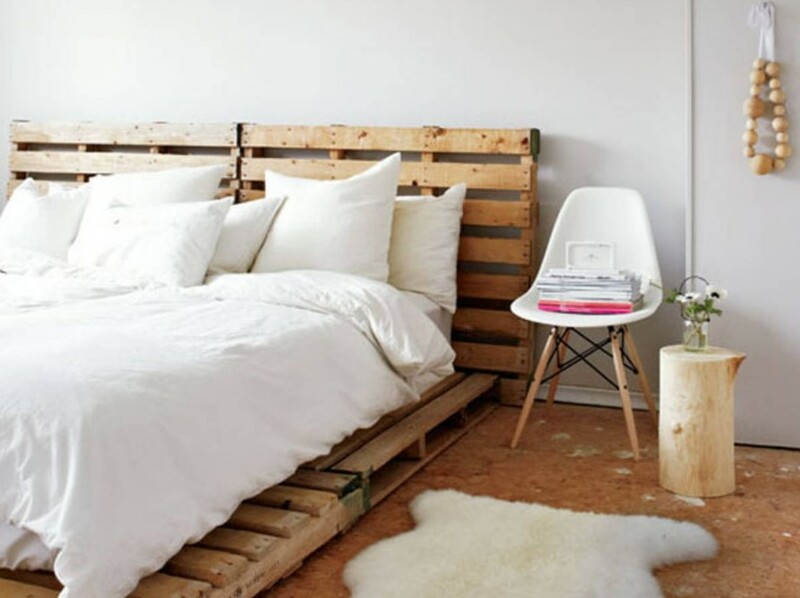 Pallets are like the solution to express some rustic charm in your room. 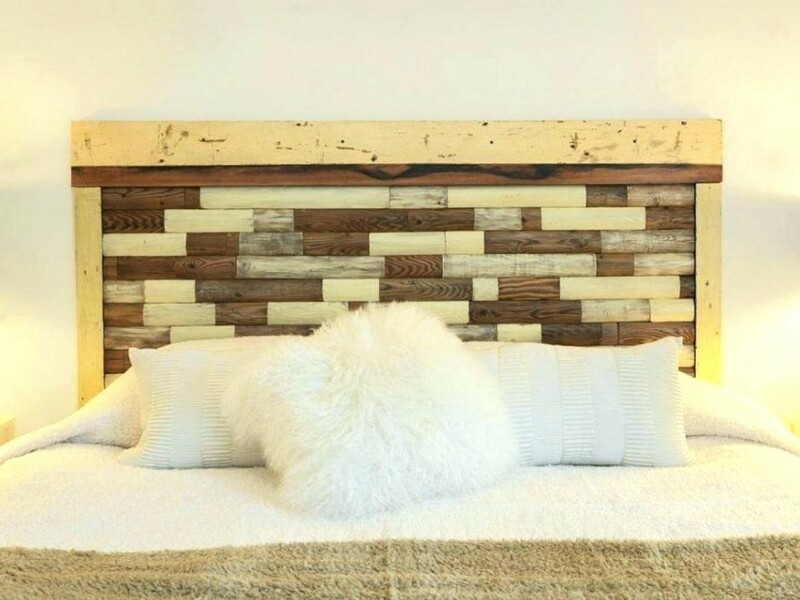 You can build your beautiful rustic headboards with pallets. As you can see, this bedroom concept is simply rustic chic. Wood textures and white colors are perfect together in this bedroom. The pallets are not just for the headboard, it’s for the whole structure of the bed which makes the rustic expression of this bedroom higher. This time we raise the level of uniqueness for headboard design. If you want something more unique and unexpected. This one would definitely surprise you. I mean, look at it, it’s one of a kind. 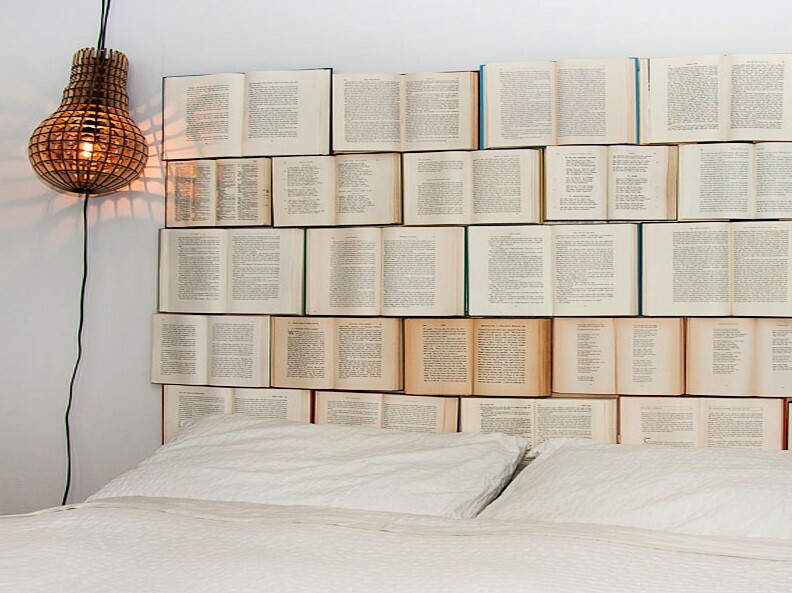 You won’t find this headboard design anywhere, even though you’re an author or a bookworm. Now, you can be inspired with this unique headboard using the recycled object. In this case, the recycled object is a collection of books. If you can think of other objects to build a headboard, just go with it and be creative. It can be the coolest and least expensive headboard design you could have in your own bedroom. 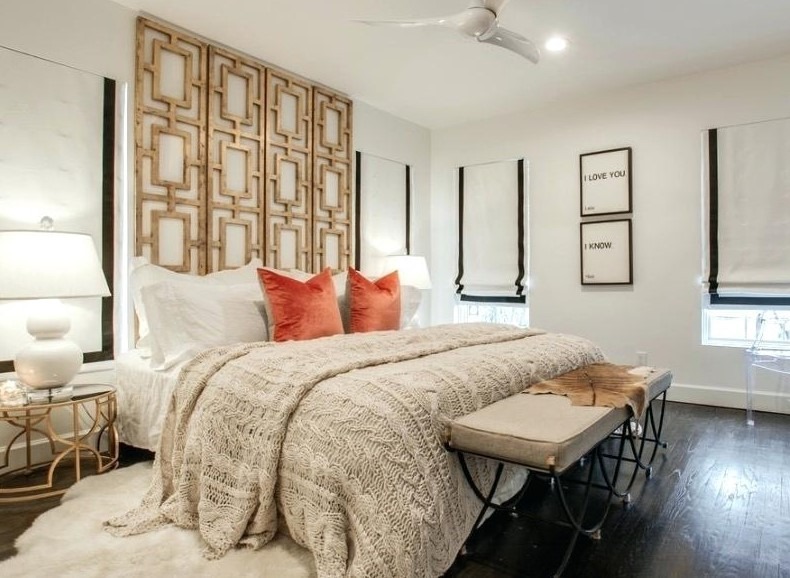 Take a look at that impressive wall panel as the headboard. It’s actually a room divider before it turns into an amazing headboard. What makes that wall panel or room screen amazing is its geometrical patterns. It expresses the contemporary charm to the whole room. For a maximal look of the headboard design, you need to remove the paper backing of the screen. Then, repaint the frame of the screen to match the color of your bedroom. As you can see, the frames are painted with gold color matched to the side table’s structure. I believe, this DIY Headboard Idea would definitely rise up the elegance of your bedroom. You can actually have a headboard with the real headboard. I mean, a headboard can be made with the back wall as the basis. As you can see, this bedroom has no headboard’s frame. It only has a big wall in the background of the bed. The designer decides to show off the wall with mural and painting to be a great headboard in this bedroom. This is a clever DIY Headboard idea which could really cut a lot of budgets. For the painting, you may need to ask an artisan to paint it for you. It would be awesome if you have the talent to paint that beautifully. If you like your bedroom to be modern in style, being simple can be a good key to start. This headboard design takes you to a new level of chic simplicity. A plywood is a simple material, it’s quite flexible too. 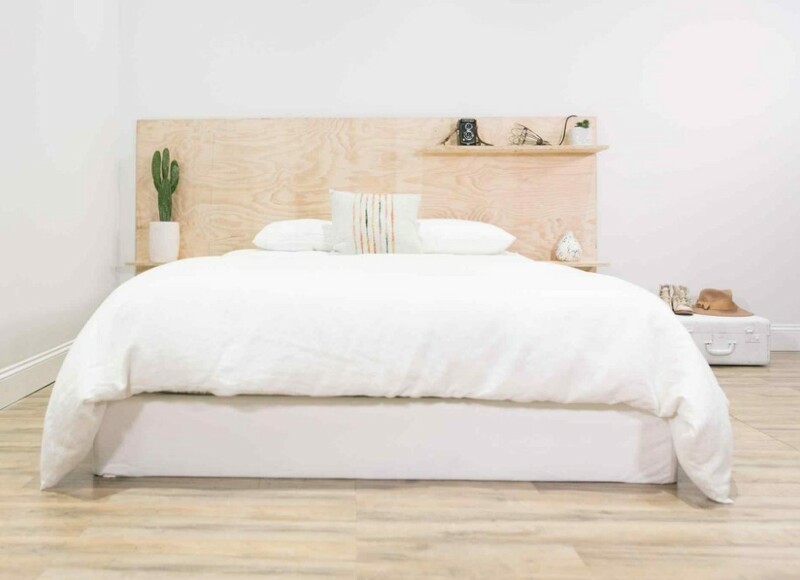 Making a headboard using plywood is pretty easy. You’ll need one large sheet of plywood that you can purchase on the local home supply store. The plywood needs to be sanded, sealed, and stained. Then, it’s ready to set behind the bed to make an earthy statement to the bedroom. 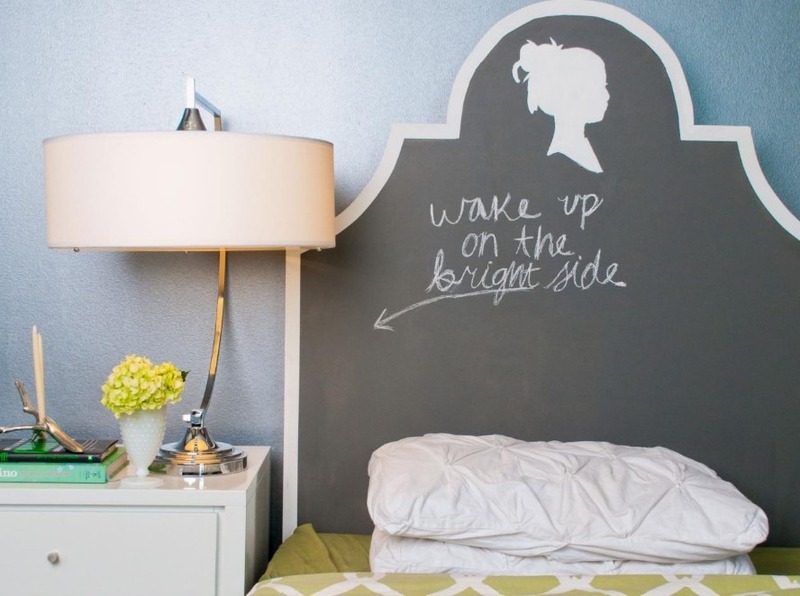 A chalkboard for the headboard, why not? It can be functional when you fill it with daily messages or quotes to inspire your day. It’s easy to make and affordable too. You can be creative by painting it based on your own personal taste. It would definitely stand out inside your bedroom. One of the most uncommon things people use to be its headboard is this one. 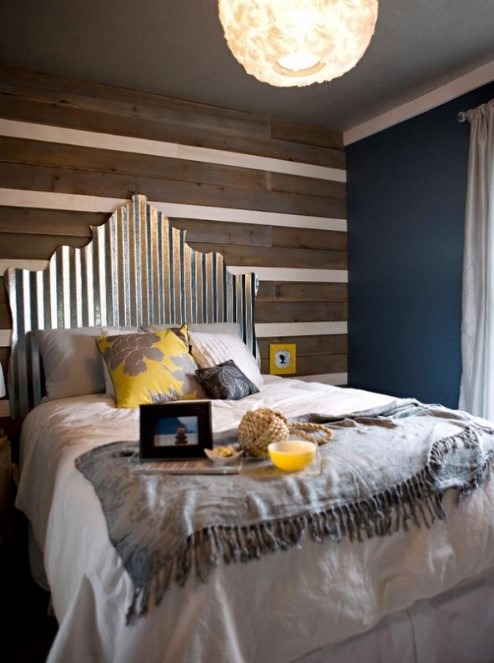 This headboard is made of corrugated metal roofing. It’s surprisingly charming in this bedroom. The key to making an impressive headboard with this kind of material is its cutting tool. The whole thing about DIY headboard ideas is already provided on that gallery above. I believe it would help you decide the best headboard design that would match your personal style. Whichever idea you choose, make sure it suits your bedroom style.